Sky Blue Cream Net Poly Georgette Resham Thread Stone Embroidered Beautiful Saree With Unstitch Blouse. 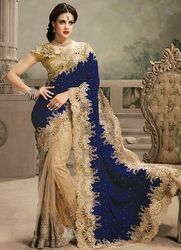 Gorgeous women indian Net Saree with pure satin and half russel net fabric including unstitched blouse. Get latest designer net sarees, Indian occasional sarees, special festival sarees in best price. Owing to the rich industrial experience and expertise in this business, we are engaged in providing Ladies Net Saree. 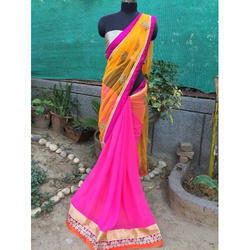 W are leading manufacturer and supplier of sarees . This saree is available in different colors and different designes. We have a wide array of sarees which you can easily order online. We have a huge collection with different styles and plethora of colors available. These sarees are available in stock and can be dispatched right away.